With its brushed aluminum finish, beefy internals and beautiful IPS display, the Lenovo Flex 6 14 is a fantastic workhorse for anyone trying to save some cash. Over the last few years, the best 2-in-1 laptops have become more powerful and varied than ever before. And, now that the form factor has become ubiquitous, we’re starting to see some amazing mid-range options, like the Lenovo Flex 6 14. While it doesn’t include an Intel Core i7 CPU, discrete graphics or a Thunderbolt 3 port, the Lenovo Flex 6 includes everything you’ll likely need in your day-to-day usage at a reasonable price. This laptop doesn’t reach the heights of something like the Lenovo Yoga 920, but it doesn’t need to. The Lenovo Flex 6 manages to fit modern components into a thin and light form factor at a bargain price. That in itself is enough to sell us on it. If you’re a student, or even if you’re just looking for an inexpensive laptop to get some work done, it will be tough to do much better. The Lenovo Flex 6 14 starts off at $549 (about £TK, AU$TK). For that price you’re getting an Intel Pentium Gold 4415U processor, 4GB of RAM and a 128GB SSD. We wouldn’t recommend this model unless you’re going to be doing some very light web browsing and other basic tasks and distractions. The 4GB of RAM and the Pentium processor really won’t be enough for much more. However, for $849 (about £640, AU$1,136) you can get the model reviewed here. And, with its 14-inch, 1080p touch display, quad-core processor, double the RAM and storage of the entry model, you’re getting a bargain in every sense of the word. These components are widely found in laptops costing hundreds more. For comparison’s sake, the US entry model of one of our favorite laptops, the Dell XPS 13, comes in at $999 (about £750, AU$1,336) – and you’re getting half the RAM and half the SSD space, while spending $150 (about £113, AU$200) more. Sure, the Lenovo Flex 6 14 isn’t as attractive, but if you’re just looking for a computer to get some work done – that difference in price is pretty stark. Considering the price of this top-end model, we really can’t find anything to complain about. It could use Thunderbolt 3, but we know of more expensive 2-in-1 laptops that are still lacking that feature. The pricing looks even better when you take into consideration that you can buy the configuration we reviewed for just $719 (about £542, AU$962) through Lenovo’s website at the time of writing. Unfortunately, also at the time of this writing, the Lenovo Flex 6 14 is only available in the US. Hopefully it’ll get a worldwide release sometime in the near future. Just like everything else the Flex 6 14 nails, the design punches way above its weight class. The laptop features this extremely luxury, brushed aluminum finish with an attractive gunmetal paint job. For the price, this laptop is frankly too photogenic for its own good. Unfortunately, you can’t do much in the way of customization – the laptop looks the way it looks. Unless you want to break out some magic markers and stickers, it’s going to stay that way. The laptop is also extremely easy to carry around. Yeah, it’s a 14-inch laptop, but thanks to its thin bezels, it actually doesn’t have much of a footprint. Measuring in at 12.9 x 9.01 x 0.69 inches and weighing just 3.6 pounds, you’ll be able to take the Lenovo Flex 6 14 no matter where you go – without having your back yell at you for the effort. What is truly surprising with the Flex 6 14, is the variety of ports on offer here. Sure, you’re not going to get Thunderbolt 3 – we’d be shocked if a laptop at this price point did – but you’re still getting a USB 3.1 Type-C, two USB 3.0 Type A, an SD card slot, HDMI and a headphone jack. You can legitimately cover all your bases without having to shell out for any added adapters – a rare feat in 2018. The thing even features a fingerprint reader! 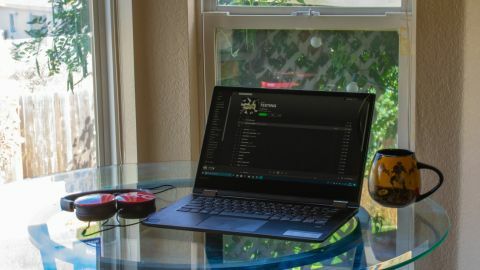 And, setting up our fingerprint to work with Windows Hello biometric login was quick and painless – and subsequent logins only took a second, much faster than the Windows Hello facial recognition in the HP Spectre x360, this reviewer’s daily driver and a premium-grade laptop. And, we don’t need to tell you that Lenovo knows how to do keyboards right – the firm has made its name on our best laptops for writers guide, and this one is no different. Even on such a small frame, the keys are large, ergonomically shaped and spread out nicely. The key travel isn’t really all that deep either – just 1.3mm – but it still feels pleasant to type on with a nice clicky response. Even the trackpad is decent – and this reviewer is extremely picky when it comes to trackpads. Not only is it a Microsoft Precision trackpad, which is awesome, but it’s responsive, accurate and Windows 10 gestures work flawlessly every time we try them. The only issue with the trackpad is only the bottom half of it is clickable – but that’s just us nitpicking. If you’re planning on working indoors most of the time, away from bright lights, the screen on the Lenovo Flex 6 14 is a huge winner. It’s not terribly bright – only coming in at 250 nits – but when you’re just trying to watch some videos or type up some documents indoors, it’s perfect. It’s an IPS display with a reflective coating and everything just kind of pops. The touchscreen implementation is also fantastic – we are able to use this thing in tablet mode without cursing under our breath like we usually do when using a mid-range 2-in-1 laptop. It’s compatible with the Lenovo Active Pen stylus as well – but that didn’t come with our review unit, so we’re not sure just how well it performs. Unfortunately, there was bound to be a negative point eventually, and here we are: the speakers. We don’t understand why, in 2018, laptop manufacturers continue to put speakers on the bottom of laptop bases. While they are loud enough to fill the room, if you’re trying to watch videos with the laptop in your lap, you’re not going to have a great time. The sound is just too easily muffled. We tried listening to TESTING by A$AP Rocky on this laptop and it wasn’t a very pleasant experience. When the device is in tablet mode, the sound is a bit better, but it’s still a bit flat. It’s not a dealbreaker, by any means, just be prepared to carry some headphones with you is all we’re saying.